"Greenwood was originally a part of Charlestown and 'Maldon' during the 1600s. Since it was mandatory for all men to attend church and participate in military drills, the men petitioned the Legislature to allow the village to become a part of Redding somewhere around 1727 because it was difficult to pass through the narrow Indian trails to the 'sea' during the winter months and spring thaw. Greenwood remained a remote area and farming village until 1844 when the Boston to Wilmington railroad began passing through the town. By 1883, the population increased and a new church, the Greenwood Union Church, was built. A commercial building was also built across the street to accommodate the needs of the new residents and businesses. Near the rear of the building, behind the Greenwood Station, was Mr. Locke's Greenwood Grove that was a popular attraction for Boston residents who summered in the area, with its picnic grove, a dance hall, cook house, monkey cage, band stand, and an observatory. 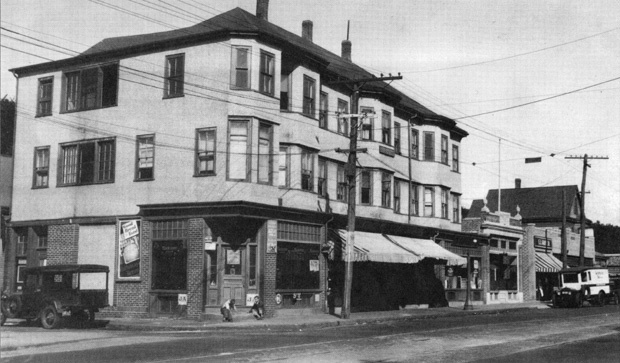 This business block at the corner of Main and Greenwood Streets housed several businesses, including the Economy Grocery Store. The white Wonder Bread delivery truck is pictured at the right, as is a personal automobile and a horse and delivery wagon." -- Text from calendar by Jayne M. D'Onofrio. “Greenwood Block, 1931,” NOBLE Digital Heritage, accessed April 22, 2019, https://digitalheritage.noblenet.org/noble/items/show/6961.